Legionella spp., facultative intracellular Gram negative, may cause acute respiratory infection in humans referred to as legionellosis. But there is a lack of information about the present and concentration of these bacteria in environmental sources. Thus, this study was designed to detection and numeration of Legionella by culturing methods at 18 sites (hospitals, official buildings, universities) in Ho Chi Minh City, Viet Nam. Fifty four water and air samples were collected from condensed water of the air conditioning system and surrounding air over 3 months period . After pre-treatment by acid and heat, the samples were analyzed for the presence of Legionella spp. by culturing onto buffered charcoal yeast extract (BCYE) agar. The results showed that the Legionella concentrations in the water samples ranged 0-200 CFU/ml. Besides, Legionella concentrations were higher in the buildings that has center air conditioning systems than the one with individual air conditioning systems. However, in the air samples, these values ranged 0-27,5 CFU/ml. Interestingly, there were a relationship of the Legionella concentrations in these two environments. Thus, the results of this study emphasized that the water from the air conditioning systems in various building may serve as a reservoir for Legionella spp. .
Key words: Legionella spp., air conditioning systems, buffered charcoal yeast extract (BCYE) agar. 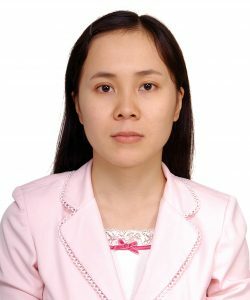 Dr Nguyen Ai Le is a lecturer at the Faculty of Environment, University of Science, Vietnam National University – Ho Chi Minh City, Viet Nam. She has completed her PhD since 2013 from Division of Sustainable Energy and Environmental Engineering, Graduate School of Engineering, Osaka University, Japan. Her research interest and specialisation are in the area of Environmental Microbiology, Bio-remediation, Biological Wastewater-Waste Treatment, Bio-energy.